Looking for a faith-based family film that teaches good values within today's teen culture? 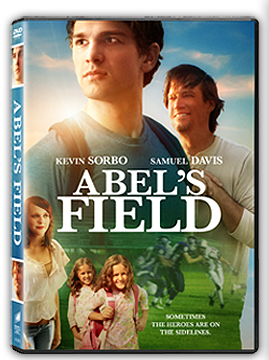 Abel's Field is about a teenage boy faced with difficult decisions and peer pressure. In this heart-warming tale, high school senior Seth must choose between right and wrong as he tries to protect his family from eviction and separation. He makes an unlikely friend with Abel, the groundskeeper at his high school. Things he took at face value begin to change and Seth is forced to decide how he is going to change his life forever. This was an entertaining and positive look at one aspect of our culture that is often portrayed negatively: teen culture. Not all aspects of teen life are how the media shows it, and this movie does a good job of showing that. The coolest person isn't always the most popular one. I thought this movie was a great addition to our movie library and one that I feel good about showing the kids. There was no rude humor or language, and the themes presented were not too mature for my ten year old. James enjoyed the film and even asked when we could watch it again. I have been offered a copy of the film to give away to one of my readers. To enter leave me a comment telling me who in your family would enjoy this film. You can also go to the Facebook Page for Abel's and 'Like' the page. Leave me a comment telling me you did that for an additional entry. I will pick the winner on January 31! Disclosure of Material Connection: I received one or more of the products or services mentioned above for free in the hope that I would mention it on my blog. Regardless, I only recommend products or services I use personally and believe will be good for my readers. I am disclosing this in accordance with the Federal Trade Commission's 16 CFR, Part 255: "Guides Concerning the Use Of Endorsement and Testimonials in Advertising." I would enjoy watching this movie along with my mom and sister. We usually watch movies all together as a family, with the youngest one wandering off if she gets bored. My daughter and I would both like this. Discovering your website this week, I am interested in knowing how I may submit a new Christian movie on DVD for your review. Please review the following information and let me know by next Thursday, (3/28/13) if you are interested. I recently discovered faith-based product review of Abel's Field, so this DVD seems like a great fit. This inspirational film comes from the makers of "Faith Like Potatoes" and "Journey to Grace". Francois is a hard-working husband and dad that gets laid off from his job. None of his efforts to get another job succeed, and he is forced to use what he has, including an old bicycle, in order to provide for his family. With the help of his "black sheep" brother, a bicycle shop owner and a pro-cyclist, Francois makes some life-changing discoveries about his life, career and faith in God. Although a fictional story, BREAK AWAY, was inspired by true events around the recession that left people without work. The message brings hope and offers practical and Biblical solutions in a very entertaining way. Thank you for your consideration. I look forward to your reply.